Kubernetes CRI(Container runtime interface) is introduced in experimental mode in Kubernetes 1.15 release. Kubernetes CRI introduces a common Container runtime layer that allows for Kubernetes orchestrator to work with multiple Container runtimes like Docker, Rkt, Runc, Hypernetes etc. CRI makes it easy to plug in a new Container runtime to Kubernetes. Minikube project simplifies Kubernetes installation for development and testing purposes. Minikube project allows Kubernetes master and worker components to run in a single VM which facilitates developers and users of Kubernetes to easily try out Kubernetes. In this blog, I will cover basics of Minikube usage, overview of CRI and steps to try out CRI with Minikube. Kubernetes software is composed of multiple components and beginners normally get overwhelmed with the installation steps. It is also easier to have a lightweight Kubernetes environment for development and testing purposes. Minikube has all Kubernetes components in a single VM that runs in the local laptop. Both master and worker functionality is combined in the single VM. In this blog, I will cover some of the standardization effort that is happening in the Containers area. I will cover some history, current status and also mention how the future looks like. In the next blog, we will look inside ACI and OCI Container images. Container image format – Describes how an application is packaged into a Container. The application can be an executable from any programming language. As you would know, Containers packages an application along with all its application dependencies. Container runtime – Describes the environment(namespaces, cgroups etc) necessary to run the Container and the APIs that Container runtime should support. Image signing – Describes how to create Container image digest and to sign these so that Container images can be trusted. Image discovery – Describes alternate approaches to discover Container images other than using registry. Container Networking – This is a pretty complex area and it describes ways to network Containers in same host and across hosts. There are different implementations based on the use-case. This is a continuation of my previous blog on macvlan and ipvlan Linux network drivers. In this blog, I will cover usage of macvlan and ipvlan network plugins with CoreOS Rkt Container runtime and CNI(Container network interface). Rkt is another Container runtime similar to Docker. CNI is Container networking standard proposed by CoreOS and few other companies. CNI exposes standard APIs that network plugins needs to implement. CNI supports plugins like ptp, bridge, macvlan, ipvlan and flannel. IPAM can be managed by a second level plugin that CNI plugin calls. We can either use multi-node CoreOS cluster or a single node CoreOS for the macvlan example used in this blog. I have created three CoreOS cluster using Vagrant. Following is the cloud-config user-data that I used. In the above cloud-config, we specify the properties of macvlan plugin that includes the parent interface over which macvlan will reside. We use IPAM type as “host-local” here, this means IP address will be assigned from within the range “20.1.1.0/24” as specified in the configuration. The macvlan type defaults to “bridge”. 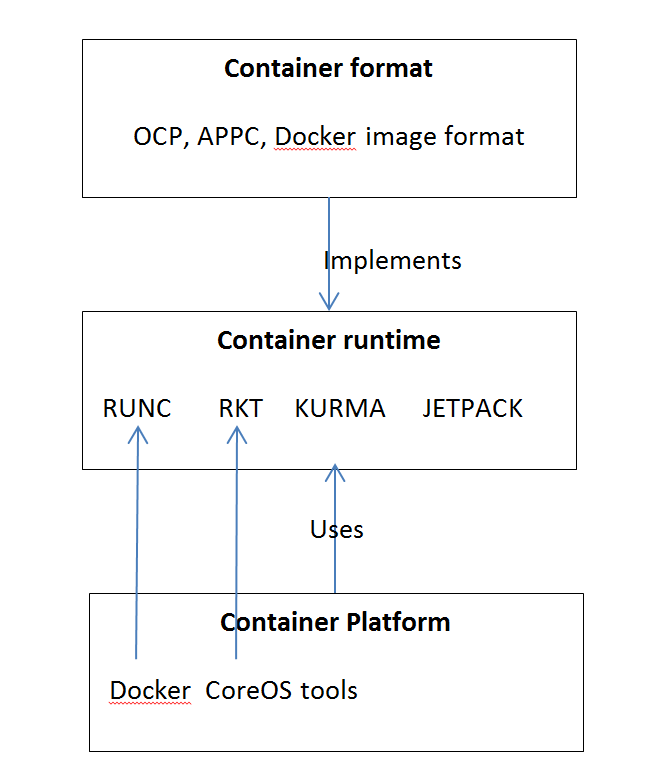 1 of the big announcements in Dockercon 2015 was the Open Container project(OCP). OCP is an Opensource project under Linux foundation to define a common Container format. Container format, runtime and platform mean different things. There are many Container formats, runtime and multiple acronyms surrounding it. In this blog, I have tried to capture my understanding around these. I have not discussed about traditional Linux containers in this blog. This is how I see the relationship between Container formats, Container runtime and Container platforms. This blog is part of my ongoing series on Docker containers. In my previous blog, I covered LXC. When I tried out LXC, I realized that there are lots of similarities between Docker and LXC. Also, I saw a recent announcement about Rkt which is another Container runtime technology. In this blog, I have tried to answer multiple questions that I had about these technologies based on reading through the reference materials mentioned below. This is a pretty controversial topic as folks have strong opinions about these technologies, I have tried to keep it as neutral as possible. How is Container management different from Container technologies? 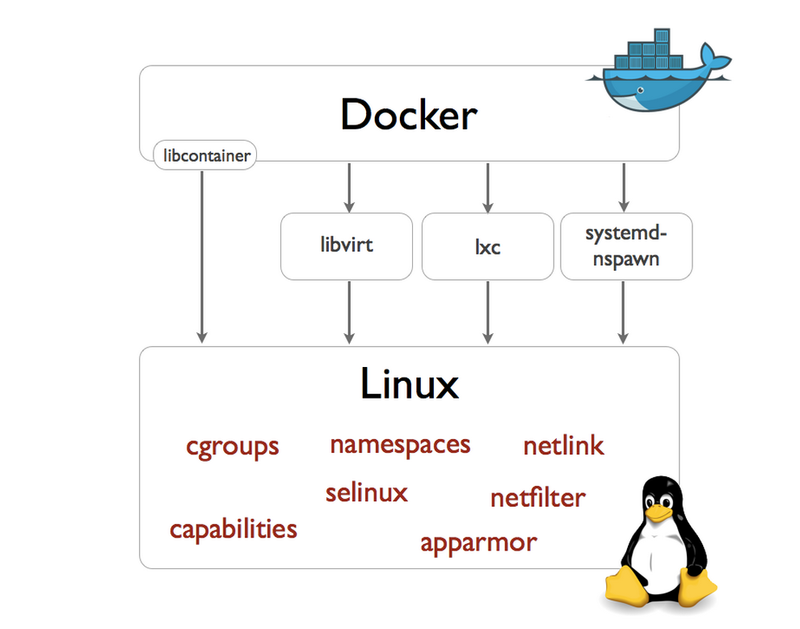 I found this diagram from Docker blog very helpful in answering the above question. Linux kernel has support for Container technologies like namespaces, cgroups etc. Docker, LXC and Rocket use the technologies available in Linux kernel to manage the lifecycle of the Container. Container management involves Container creation, deletion and modification, image format and the tools around it. Before Docker version 0.9, Docker was using LXC to interact with Linux kernel. From Docker version 0.9, Docker directly interacts with Linux kernel using libcontainer interface that they developed. How is Docker different from LXC?